Dr. Aaron Adams posted this picture on Facebook. I was speechless when I saw it and saddened. Bonefish are such a mighty fish that to see one like this is kind of humiliating to me. It's how I feel when I see sharks or shark fins (now, really just in the papers, but I have seen fins before). Photo courtesy of Capt. Terry Duffield. Coach Duff and Captain Mike Hennessey have guided hundreds of anglers here in Hawaii, now help us stop seeing this in markets caught in gillnets. We want the bonefish to be made a "gamefish" at the very least in regulations. Go ahead, catch one on rod and reel and bring it home! Prepare it the way grandma did, fishcake or lomi style! We understand culture and traditions. But the druggie gillnetters, the vendors in Chinatown who buy anything you bring them legal or not need to be shut down. The damn things are protected everywhere but here. Hell, we have a Trout Unlimited chapter that raises money to plant Hatchery rat and completely invasive trout in Kauai rivers but looks the other way on protecting the world's biggest and truly native bonefish with simple "gamefish designation". This makes it illegal to sell bonefish commercially yet still allows the great people of Hawaii to catch, enjoy and harvest O'IO as traditions allow. If you haven't already, it's time to join the Bonefish and Tarpon Trust. 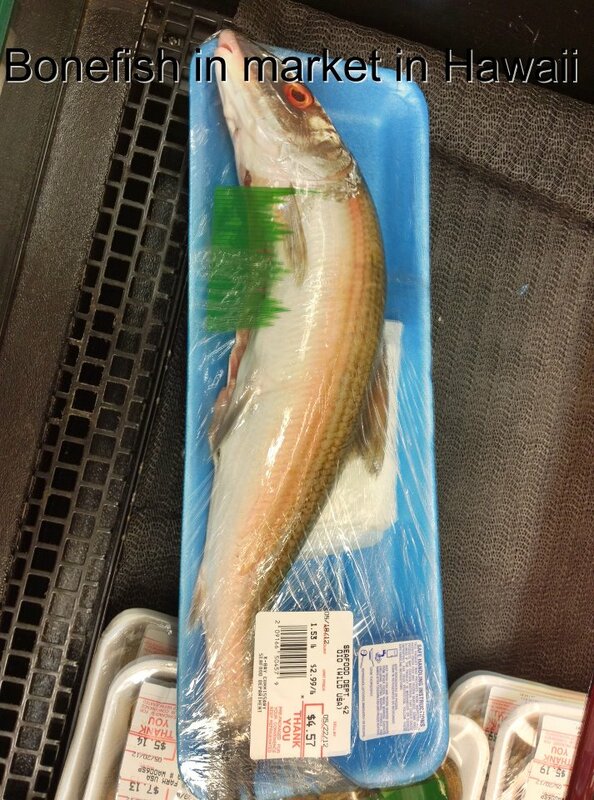 If I read it right, the cost of that fish is $4.97. When I go bonefishing, I probably spend close to $100 per fish I catch and then let it go. Imagine the great fishery that could develop in Hawaii with a thoughtful preservation plan. I too am disgusted. Today I saw the same packaged bonefish at the Navy Commissary at Pearl Harbor. There had to be over 20 packages. As a fellow member of BTT, this is unacceptable. I have been fly fishing for o'io since the mid 1980's. I used to see plenty small schools patrolling the flats. As we moved into the 90's, the schools became more scarce and smaller. Nowadays I am lucky to even see fish, its all ones and twos. I would love to see some regulation on the fishery here in Hawaii, and not just for o'io. For a tropical paradise there just are not many fish inhabiting the reefs anymore. What a bummer. Man. That makes me sad. i do have respect for them but many years before there was TU or the IGFA, the locals ate them. i have friends who live in ewa beach and we have a ball fishing for them in deep water out in the pacific. Please help us protect Hawaiian Bonefish from gill nets and commercial sale. See the following article for more info, please sign the petition (link is at the bottom of the page). Thanks in advance for your support!